Those who have been following my blog over the years (who are you, by the way? Leave some comments every now and then) know that I am a huge fan of Mediterranean cooking – their dishes are rich not only in colors but also flavors, which is a feast to the eyes and to the palate. I have repeatedly written about them here and cook these dishes quite often – proof of that are the spice-stained pages of my cookbooks on the recipes I have not yet memorized. Now couscous is something that has become sort of a staple at our home since I discovered it around the time I first subscribed to the now-defunct Gourmet Magazine (oh, how I miss it!) – Bulgur wheat is quite common in supermarket shelves in New York, but a recent discovery is pearl couscous, which is also marketed as “Israeli” couscous in some places. 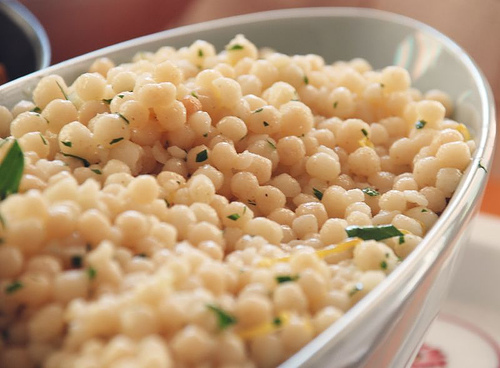 The difference between that and the regular kind is that pearl couscous is essentially ball-shaped pasta made with semolina or wheat flour. It does need to be cooked, unlike the ordinary kind that you just soak in hot water, and once ready it can be prepared in many ways. When cooking, it is good to use some vegetable or chicken stock along with the water to add flavor (some use those bouillon cubes, but I certainly don’t recommend them in this case), or simply use salted water. The cooking process is not different from most pastas – just boil the water and add the couscous (1 cup makes about two or three servings) and let it cook for about 7-8 minutes. Drain, reserving about a cup of the seasoned cooking water for the mix later. I like to serve it with vegetables and fish – a delicious light meal that works on every season. 2. Season the fish with salt and pepper, and sauté onions and garlic until tender. Remove the garlic and onion mixture and add fish to the frying pan, adjusting olive oil if needed. Once fillets are cooked, return the garlic and onions and sauté briefly until fish is fully coated. Reserve. 3. Mix the cooked couscous with the vegetables, and add some cooking water if it seems dry. Serve fish over couscous and vegetable mix.